Editor’s Note: Images are used throughout this article to illustrate the effects achieved with border-image. To see this in action. and view the code, go to the demonstration page. A feature that is new in CSS3, but not so new to browsers, is the border-image property. Border-image provides a method to add decorative borders to any element. With the border-image properties you can create decorative borders for elements, beyond simple rounded corners, with images of very small file size or even with gradients. The border-image property allows you to take a small image, slice it virtually into nine sections, and place /spread the portions of your small image across a much larger element. You can take an image and stretch it across a button or a whole page. We’ve used the image on the left as a border-image for the div on the right, maintaining the corners, while stretching the center of the border-image to cover the entire div on the right. In this second example, instead of stretching the middle of the border-image, we’ve repeated, slightly distorting the image if necessary to ensure we don’t have a broken image in supporting browsers.To ensure that the image is not ‘broken’, the width should be a multiple of the slice’s width. While we’ve repeated the top, bottom and sides, we’ve maintained the four corners, creating a stamp-like effect. Next, we’ll cover how to take a background-image, virtually cut it up, and either repeat or stretch the image to cover the borders and background of our element. At this time, Opera, Firefox, Chrome and Safari all support the vendor prefixed border-image shorthand property but don’t support any of the longhand properties that make up the shorthand. So, while we’ll cover the various properties that define border images, you should always use the shorthand instead of the shorthand properties described below. Just as you can include gradients, base 64, gifs, jpegs, pngs, and even SVG images as background images, you can include all these image types as border images. The border-image-slice property defines from one to four lengths that set the distance from each edge of the image marking the area that will be used to cut, or slice, up our border image. The border-image-slice property values represent inward offsets from the top, right, bottom, and left (TRouBLe) edges respectively of the image. In effect, with the four lines you define, the browser divides the one border image into nine regions: four corners, four edges and a middle. The four corners maintain their exact size. The other five values can be stretched or repeated or a combo of the two (round), depending on the values of the other border-image properties. The black lines in the images above delineate how our four defined slice lines cut up our border-image. In our examples, we’ve sliced the image 30px in from each side for our gradient, and 8 pixels in from each side for our stamp. For bitmap images, the omitted values are interpolated as pixel values. 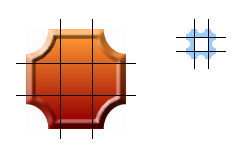 For vector images (SVG), the values are coordinates. For percentages use the percent sign (%). The border-image-width property sets the width of the element’s border. If the border-image-width property is declared, it takes precedence over the border-width, if one is declared. If omitted and the border-width is omitted, the value defaults to the border-width default which is ‘medium’, or generally 3px. Since including border-image-width in the shorthand currently makes Opera fail, it is recommended to exclude this property, and instead opt for including the CSS2 border-width value. Having the border-image-width be the same width as the border-image-slice will create the best looking border image with no distortion. But, they don’t need to have the same values. The slice will be stretched (or contracted) to the width of the border-image-width if the values are not the same. Remember the box model! As you increase the border-image-width, your element will grow larger. The border-image-outset property specifies the amount by which the border-image area extends beyond the border box on all four sides. It is not supported in any browsers, and makes the entire declaration fail, so, for now, don’t include it. The default value is 0. The border-image-repeat property allows you to delineate how non-corner images (the sides and middle) are repeated and/or scaled. The first value is the top and bottom, the second value is the left and right sides. If the second value is omitted, all four sides will have the same value. The specifications currently define four possible values, but only three are well supported. stretch means that the image should not be tiled, but rather stretched to fill the area. repeat means the image is tiled ( or repeated) to fill the area. If the area allocated for the repeating image is not exactly divisible by the width of the image, the last tiled image may be cut off. With round the image is tiled (repeated) to fill the area, with the image being scaled down, possibly losing its aspect ratio, but ensuring that the image is never cropped. Note that Webkit doesn’t support the round value, replacing it with repeat instead (which is better than failing, I guess). The space value is not currently supported, but when supported, the border-image will be repeated as many times as can fully fit in the area provided, with the tiles evenly spaced, showing white space between the tiles if the width provided is not an exact multiple of the image size. In our above examples, we used stretch for the gradient and round for the stamp. You will always want to stretch gradients, as repeating them creates harsh lines as one tile ends and the next begins. And, while it may seem to make sense to use repeat for the stamp, we have no way of knowing if the image is evenly divisible by the width of our design. The round does distort the image ever so slightly, but that is better than having the image cut off. As mentioned earlier, no browser supports the longhand properties defined above, but Opera, Firefox, Chrome and Safari understand the prefixed shorthand border-image property. Now that we understand the components of the shorthand property, let’s put it all together. Images are used throughout this article to illustrate the effects achieved with border-image. To see this in action. and view the code, go to the demonstration page.